PIPE HUMIDOR: An extremely popular Millersburg item, this humidor stands 8” tall, measuring 5” across the top opening. Encircling the top of the bowl are the acorns and leaves, with a leaf/grass-like design around the base. The life-size smoking pipe adorning the lid allows no speculation as to the use for the piece. Inside center of the lid are prongs for holding a damp sponge for keeping the tobacco moist. All known examples are brilliantly colored, having exceptional iridescence. At the time Marie McGee was compiling the data for her Millersburg Glass, As I Have Known It, in 1994-5, we helped her gather research for some items, including this humidor. We located six examples in amethyst, six in green, and eight in marigold carnival. 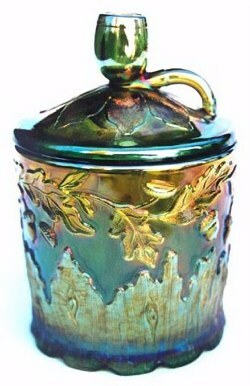 A personal story attached to one of the green humidors may interest you: As we have stated for all the years we have been associated with this habit-forming entertainment of collecting, it has always been more the attachment of persons, than the glass itself, which attracts and becomes most meaningful over the years. A piece of glass will escape ones ability to attain, and be forgotten in a short time. The individual personalities surrounding that glass are never forgotten. Since these pieces usually sell privately, many collectors never have the opportunity of purchase. However, in the late `80's when the Vining collection was sold, we were quite happy to gain this choice piece, enjoying its unusual qualities, and took it along when presenting a program for one of the Club Conventions. Any of you who know Cecil Whitley are familiar with her quiet, very formal and ladylike approach to all things. She spent her working years as a school administrator, and has the efficient, mannerly demeanor which accompanies such a position. When she approached me at the conclusion of that program, saying she and Floyd already owned a marigold and amethyst Pipe Humidor, but had never been able to purchase a green one; her question was: should we decide to sell ours at any time, would we please consider them? Now, I ask you. How many of you could refuse such a legitimate question as that? You've guess it! The deal was made. Cecil and Floyd perhaps remain the only couple in Carnival Glass circles to have such “pride of ownership”. Theirs is a home where only the best is collected. Pipe Humidors are prime examples of what serious collectors desire! All three examples in this collection are perfect! HANGING CHERRIES CHOP PLATE: Millersburg plates in this pattern are very rare and always bring a good price. The only known 8” in green brought $4250 at a Seeck sale in 1994. An 8” amethyst having silvery finish brought $2100 that same year. There are about half dozen known 6” marigold having radium finish. One of these easily brought $3400 in 2003. When we get around to the chop plate size, which is 11”-11 ¼”, the only known amethyst with silvery attributes sold for $4000. Said to be the only known marigold in chop plate size realized $3000 in 1993. Then in early 2004, this marigold example was for sale over Ebay. We wonder that it could be a second example or remains the only one known, which had sold previously in '93? According to information provided in the June issue of ACGA Newsletter, this plate and a Gay Nineties water pitcher were purchased recently (2004), each from a Millersburg area farm sale. 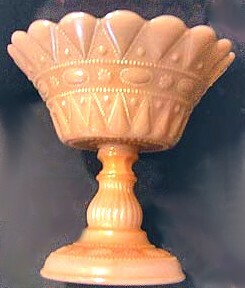 DANCE OF THE VEILS: Two types of top edge treatments were used for the possibly half dozen marigold examples known in this rare Fenton vase. In addition to the ruffled top, some have a smooth, flared top surface. Opposing sides display two veiled dancing ladies, each in a different pose. One lady has her hands above her head, the other with one hand above her head, holding a veil. Height: 8 ½”, base diameter: 4 ½”, vase opening diameter: 7 7/8”, Circumference under the ruffle is: 15 5/8”. The body of this gorgeous vase example is an overall rich, dark-toned marigold color. The ruffle has a lovely radium finish front and back. A two-part mould, there is a 2 ¾” distance between each of the decorated panels on the vase. Following a long residence in the Waymon and Nilah Espy collection, this, the only known perfect ruffled vase! It has recently taken up residence in the Don and Lynda Grizzle collection, where it will continue to be lovingly cared for. 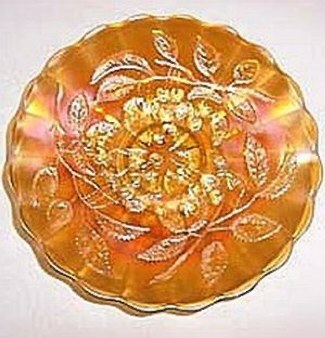 Marigold is the only known old color in carnival glass. 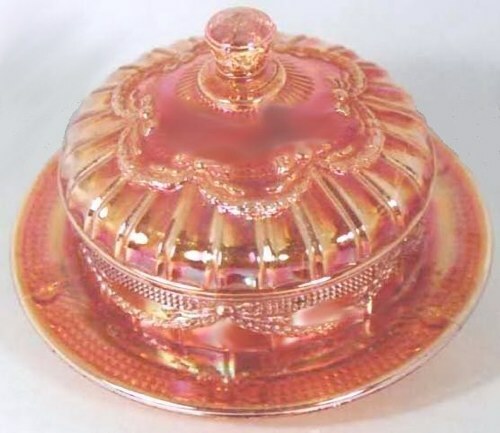 Fenton has produced various other types of glass examples using this pretty mold. 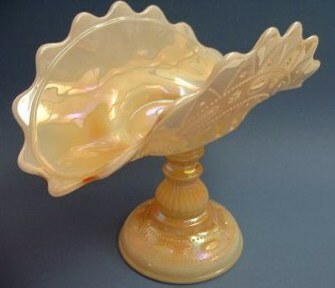 Persian Pearl, the equivalent to white carnival is reported in the Whitmyer book on Fenton Glass -1909-1939. COUNTRY KITCHEN breakfast set: Measuring a mere 3 1/2'” in height, this set is quite diminuitive. Many articles from this pattern were found in the Millersburg crystal line. It is a mystery as to why so few were made in Carnival Glass. Large berry bowls are seen in marigold. While attending the June 2004 ACGA Convention in Dublin, OH, we saw a 5” marigold berry bowl, as well. A spittoon whimsey is one of the top rarities, with only one known in amethyst Carnival. This shape comes from the spooner mould. Swung vases, also classified as whimseys were made from the same spooner mould. The four piece table set is very rare, but complete sets in amethyst and marigold are known. The covered sugar bowl and the spooner have been reported in vaseline. GARLAND and BOWS: This lovely large compote is from the Finnish manufacturer Riihimaki. The few known examples are endowed with marigold. Some compotes have no marigold on the base/foot. As you can see, this pictured example has a nice marigold application on the foot. None have sold at conventional carnival glass auctions for more than five years as of this writing! The lovely design found on the underside of the bowl is repeated on the underside of the foot. This compote stands 8 ¼" tall and is 8 ¼" in diameter. 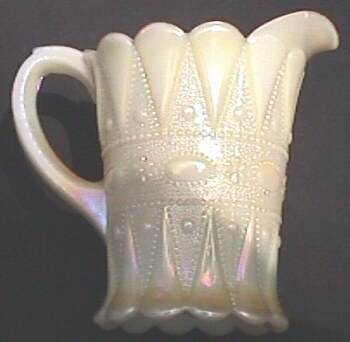 Reported in a 1939 catalog, other shapes on record are a creamer and sugar. 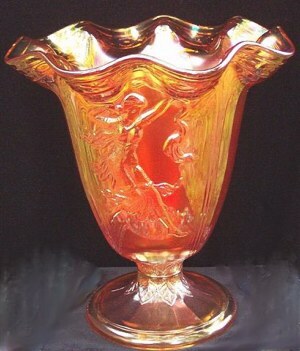 A photo on page 205 of The Art of Carnival Glass , by Thistlewood's, displays this lovely marigold compote. Page 209 of the same book displays a marigold covered bonboniere', which could easily serve as a covered sugar or butter if need be, along with a blue, two-handled sugar bowl. This will offer some idea of the scarcity of this very elegant pattern. One of those reportedly was purchased for $145.00 some years ago at a MI auction. Another example was found in MD and sold for $118.95 with shipping, over Ebay recently. 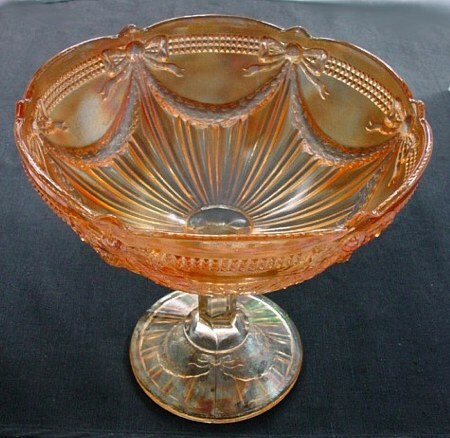 The third known compote resides in United Kingdom. In June of 2004, a lovely example having no marigold on the base sold over Ebay for $49.99, a bargain basement price for such a rare design. This is a great example of a very desirable pattern outside the realm of "familiar" designs! Personal research and knowledge are tremendous attributes when collecting old "vintage" carnival glass. Corrections to the information offered here, made in Aug. 2004 include the presence of yet another marigold compote, bringing the total to four known. GARLAND and BOWS--Covered Bonboniere' or Butter Dish, if you prefer. LACY DEWDROP: As with some of the iridized candlesticks which are more in line with stretch glass, carnival collectors do enjoy certain designs which are not “strictly” considered to be in the more easily classified items of “carnival glass per `se.” This Lacy Dewdrop pattern, which is of Phoenix origin, is another of the “acceptably collectible” pieces found in Carnival Glass collections. The lack of ready availability of these items creates a stopgap for many of us. Months pass without any of the shapes being in sale categories. This lovely banana boat on a pedestal is quite unusual. It stands 9” tall, and is 11 ½” long x 7” wide. Overlay of the marigold iridescence displays lighter sides than on the interior of the boat and that seen on the pedestal. A piece or two of this specialty glass lends a nice variation to a collection. We believe that this banana boat is formed from the basic covered compote mold. The ridge for a lid is visible. LACY DEWDROP Compote: This compote is nicely covered with evenly applied overspray of color and iridescence. Pearlized is another name used to describe the finish on these pieces. Other shapes include watersets, two compotes (one covered), two bowls (one covered), covered sugar, and a stemmed goblet. Lightly iridized, we are pleased to be able to show an example of this scarce piece. 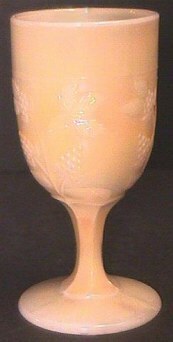 Iridized milk glass, this goblet is 6” tall, having a top opening of 3”. 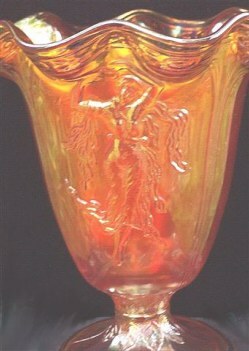 As with other examples of iridized Phoenix Glass, this piece is very difficult to locate.